The below photo is of a resistor pack and thermal cut off switch I removed from my 1998 Winnebago 32' Brave on GM P-30 chassis. The A/C unit was supplied by SCS Fridgette to Winnebago. My local auto parts stores are unable to match either of the parts for me. The Thermal cut off has no numbers or brand of any kind still visible on the unit. 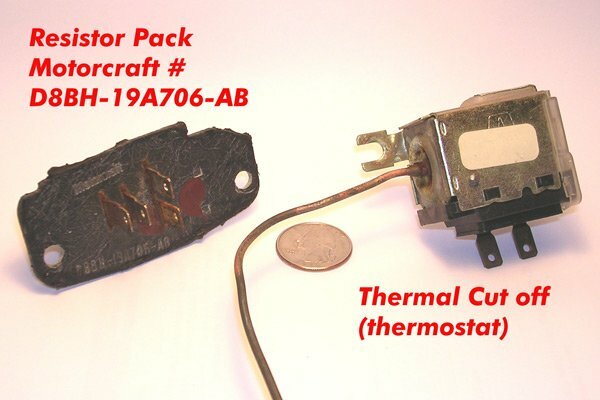 The resistor pack is a motorcraft part (in my GM chassis) with the part number as in the picture. Anyone who can help find a source for these two parts please let me know. I have sent a message to SCS Fridgette about the parts but have received no response to date. Please help. Tom, have you sent this request with the attached photo to Owner Relations? When I contacted owner relations about the fan speed problem they simply referred me to SCS as the supplier. I have not tried to send them the photo. I am still waiting an answer from SCS to see what they have to say. I have been to the NAPA and Motorcraft sites and attempted to cross check the part number on the Resistor pack and search results come back negative - like it never existed. I still find it strange that a Motorcraft part was used in a GM chassis, but then the A/C is an aftermarket product installed by Winnebago. Try this company. They a a supplier of RV AC systems. I think thats it on the above post link! thanks that is EXACTLY what I have been looking for. I will be contacting them today for prices.then maybe give Lichtsinn a call too. Acme manufactures AC and heating systems for a lot of RV manufacturers. There are links on their homepage to a lot of diagrams and information for troubleshooting AC and heating. I have downloaded the ones for my coach and have them on my laptop in case I need them while traveling. I burned out a blower resistor a few years ago and spent days searching. The RV dealer sent me to the GM dealer who wanted to send me back to the RV dealer. Both said it was the others part. That's when I found out about Acme. I ordered mine directly from Safari for about $7. They didn't even ask for my coach model. They all used the same resistor. That was before Acme had a online ordering. I looked at their site and the parts are an exact match to what I was looking for. I have sent them an e-message requesting price and availability on the parts. I will keep the link to the site as you are correct, lots of valuable information there.